As our lives become more congested with schedules and digital chatter, we need to find creative ways to unclutter our minds. Majestic Expressions adult colouring books from Broadstreet Publishing offer 45 intricately detailed images to colour in, all of them with God-honouring themes. Rediscover one of the simple joys of your younger years! 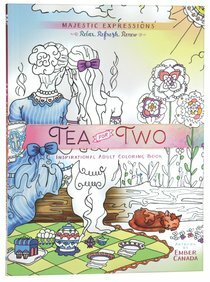 About "Tea For Two (Majestic Expressions) (Adult Coloring Books Series)"
Why not eliminate some of that stress as you ponder the incredible God-given blessing of relationships, as beautifully illustrated in Tea for Two: Coloring Friendship. Take a break from your busy schedule, and focus on filling the intricate images with the beauty of color. Watch each page come alive as you allow your creativity to flow freely.